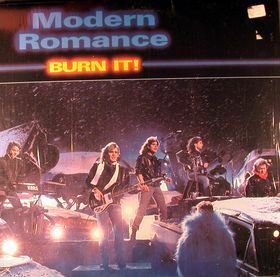 Eighties Marketplace: Modern Romance - Burn It! Modern Romance were a British pop music band that found popularity in the early 1980s. Formed in 1980 by previous members of an earlier Punk rock band, The Leyton Buzzards, the band enjoyed a string of UK chart hits before they broke up in 1985. They are probably best known for their hit single, Best Years of Our Lives (1982 song), which made the UK Top 10 and later featured in the movie Shrek (2001) and its subsequent soundtrack. Geoffrey Deane and David Jaymes formed Modern Romance in 1980, having previously been the mainstays of the punk parody band the Leyton Buzzards. Following hot on the heels of their début UK chart success Everybody Salsa in 1981, Modern Romance reached the Top Ten of the UK Singles Chart with Ay Ay Ay Ay Moosey - an eponymous chorus chanting salsa linked lyrics. After this, they scored a #2 hit on the Billboard Dance chart with the single "Can You Dance", backed with a 'clubland mix' of the same track and another song, called Bring On the Funkateers. After covering the 1955 hit Cherry Pink And Apple Blossom White, Deane departed the band to pursue solo projects.